MIAMI, Aug. 15, 2017 /PRNewswire/ — Carnival Corporation & plc (NYSE/LSE: CCL; NYSE: CUK), the world’s largest leisure travel company, today released its 2016 sustainability report as part of the launch of its new dedicated sustainability website. The report and complementary site detail the company’s sustainability efforts and the progress made in 2016 toward its 2020 sustainability performance goals. The report was prepared in accordance with the Global Reporting Initiative (GRI) G4 “core” level, and a full copy can be downloaded from Carnival Corporation’s new site. As part of the site, Carnival Corporation’s president and CEO Arnold Donald invites readers to join the cruise company on its sustainability journey through a welcome video that highlights key elements of the company’s commitment to sustainability. On the new site and report, easy to read messaging – enhanced by colorful graphics, engaging photos and videos – provides updates on progress made during 2016 in sustainability performance. The report was designed to share sustainability practices with stakeholders, including the company’s employees, the millions of guests who cruise with Carnival Corporation brands and investors. Pioneering the use of LNG (liquefied natural gas), the world’s cleanest burning fossil fuel, and introducing the first cruise ship ever fueled with LNG from trucks while in port. Carnival Corporation and its brands implement extensive measures to deliver on its commitment to continue to keep guests and crew members safe and comfortable, protect the environment, develop and provide opportunities for its workforce, strengthen its stakeholder relations and enhance the communities in which the company visits and operates. Those measures are detailed in the company’s 2016 sustainability report. As part of the company’s commitment to reduce air emissions and improve air quality in the environments where its ships visit, Carnival Corporation pioneered the use of LNG with the introduction of the AIDAprima in 2016. AIDAprima is the first cruise ship in the world with a dual-fuel engine that can be powered by LNG while in port. The company will continue its efforts to pioneer use of this clean-burning fuel with seven next-generation ships on order that will be powered by LNG while in port and at sea. The company also signed an agreement with Shell to supply LNG. In 2016, Carnival Corporation continued its partnership with The Nature Conservancy (TNC), one of the world’s leading conservation organizations, with its $2.5 million financial commitment over a five-year period, which started in 2014 to support important research for marine conservation. 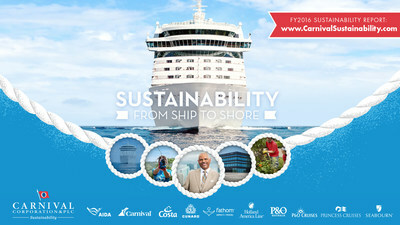 In June, Carnival Corporation was recognized for producing the year’s most engaging and informative 2015 sustainability report in the 10th annual Corporate Register Reporting Awards, the only annual global awards program honoring excellence in corporate social responsibility and sustainability reporting. Together, the corporation’s cruise lines operate 103 ships with 231,000 lower berths visiting over 700 ports around the world, with 17 new ships scheduled to be delivered between 2018 and 2022. Carnival Corporation & plc also operates Holland America Princess Alaska Tours, the leading tour company in Alaska and the Canadian Yukon. Traded on both the New York and London Stock Exchanges, Carnival Corporation & plc is the only dual listed company in the world to be included in both the S&P 500 and the FTSE 100 indices. MIAMI, Aug. 4, 2016 /PRNewswire/ — Carnival Corporation & plc (NYSE/LSE: CCL; NYSE: CUK), the world’s largest leisure travel company, today released its 2015 sustainability report detailing the progress made in 2015 against its 2020 sustainability performance goals. The report’s details show the company is on track to meet its goals in the next four years, with sustainability efforts highlighted across its 10 cruise line brands. The report was prepared in accordance with the Global Reporting Initiative (GRI) G4 “core” level, and a full copy can be downloaded from Carnival Corporation’s site. Carnival Corporation and its brands implement extensive measures to deliver on its commitment to continue to keep guests and crewmembers safe and comfortable, protect the environment, develop and provide opportunities for its workforce, strengthen its stakeholder relations and enhance the communities in which the company visits and operates. Those measures are detailed in the company’s 2015 sustainability report in three key areas – cruising, commitment and community. In 2015, Carnival Corporation introduced its 10th and newest brand, Fathom, which is pioneering a new travel category, social impact travel, which combines people’s love for travel with their desire to make a difference in the world. Later in the year, Carnival Corporation made history with its Fathom brand by receiving U.S. approval to sail to Cuba, laying the groundwork for it to become the first cruise company in over 40 years to sail from the U.S. to Cuba in May of 2016. In 2015, Carnival Corporation made progress toward its focus on maintaining measured capacity growth with the delivery of innovative, more efficient ships for its fleet by finalizing agreements for 15 new ships for delivery between 2016 and 2020 – four of which will be next-generation ships that will pioneer a new era in the use of cleaner fuels as the first cruise ships to be powered by LNG both at sea and in port. The introduction of LNG – the world’s cleanest burning fossil fuel – is a major step for the corporation in reducing its carbon footprint from the reduced carbon and cleaner emissions of LNG. In 2015, AIDAsol from the company’s AIDA Cruises’ German-based brand was the first cruise ship in the world to be supplied with power by an LNG hybrid barge while in port. Another key milestone for the company in 2015 was the opening of its newest port and Caribbean destination, Amber Cove, located in the Dominican Republic. The new destination represents Carnival Corporation’s single largest direct port development project with an $85 million investment to date, the largest cruise industry investment ever made in the Dominican Republic. As a part of Carnival Corporation’s commitment to the region, its Fathom brand also announced in 2015 that it would be making trips every other week to the area to enrich the lives of its travelers as they work alongside the locals, assisting them in improving the quality of their lives. In 2015, Carnival Corporation continued its partnership with The Nature Conservancy (TNC), one of the world’s leading conservation organizations, with a $2.5 million financial commitment over a five-year period, starting in 2014. More information about Carnival Corporation’s sustainability efforts and the full versions of its past sustainability reports can be found here. Additional information can be found on www.carnivalcorp.com, www.carnival.com, www.hollandamerica.com, www.princess.com, www.seabourn.com, www.aida.de,www.costacruise.com, www.cunard.com, www.pocruises.com.au, www.pocruises.com and www.fathom.org. MIAMI, June 7, 2016 /3BL Media/ — Carnival Corporation & plc (NYSE/LSE: CCL; NYSE: CUK), the world’s largest leisure travel company, announced today that its second consecutive year of supporting The Nature Conservancy helped the organization continue its momentum in protecting the world’s oceans and seas. As part of achieving its 2020 sustainability goals, Carnival Corporation is providing through the Carnival Foundation a $2.5 million gift over a five-year period to The Nature Conservancy, which began in 2014. 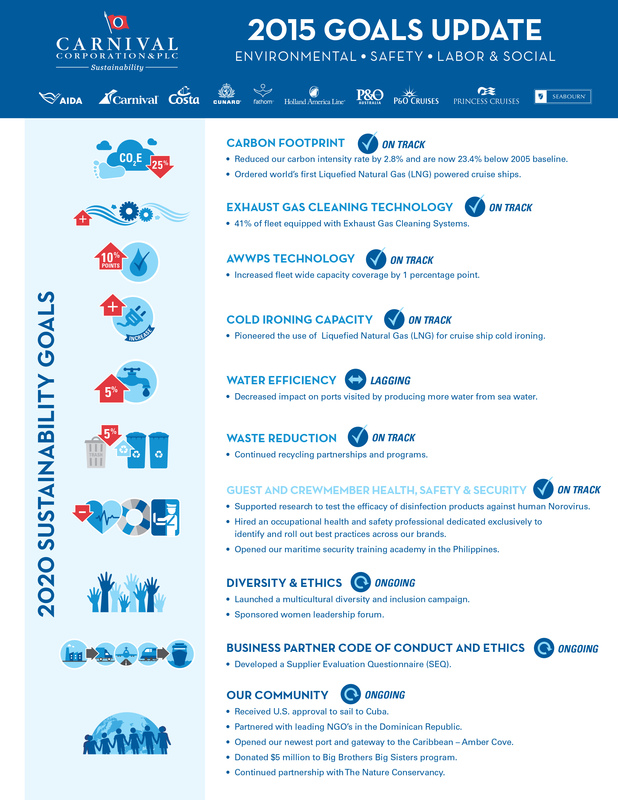 Carnival Corporation’s 2020 Sustainability Goals – embraced by the company and its 10 cruise line brands around the world — reflect the company’s dedication to operating with a high level of responsible sustainability in the oceans, seas and ports of call in which its ships operate. The donation to The Nature Conservancy and many other environmental groups underscores its commitment. Carnival Foundation is dedicated to creating positive change through empowering youth, enhancing education and strengthening families. In the past five years alone, Carnival Corporation — which includes 10 global brands — and its 120,000-plus employees have made more than $30 million in financial contributions and in-kind donations to a variety of local and national charities. Following the example set by Carnival Corporation’s founder, the late Ted Arison, and continued by his son Micky, chairman of Carnival Corporation, Carnival Foundation endeavors to make South Florida and other communities better places to live and work. For more information visit www.carnivalfoundation.com. In 2014, Carnival Corporation & plc conducted an analysis to reevaluate the significant economic, environmental and social aspects of its operations, to further assess the relative impacts of these aspects, as well as to determine the required components to transition from GRI-G3.1 to GRI-G4 sustainability reporting. Known as a “materiality assessment”, this analysis enables the company to determine which aspects substantively influence the assessments and decisions of its stakeholders; recognize and act effectively in relation to sustainability related opportunities and risks; and, determine how these aspects affect its stakeholders, society and the environment. During this evaluation process the company simultaneously conducted a benchmarking analysis of major hospitality, travel and marine industries. These two analyses provided a framework for determining which aspects to focus on in its fourth annual Corporate Sustainability Report. Reevaluated the significant issues presented in its prior sustainability materiality assessments. Reviewed the environmental, social, governance and economic aspects and indicators in the GRI G4 sustainability reporting guidelines, as they apply to its business. Analyzed the results of stakeholder sustainability engagements, including investor and customer inquiries, questionnaires and surveys from rating organizations, industry reports and analyses, policies and regulatory guidance, among others. Benchmarked its sustainability strategy using publicly available information. Held internal meetings to discuss company perspectives on sustainability aspects and impacts. Examined over 50 aspects and issues, including areas of significant organizational impact, as well as broader sustainability trends (GRI G4 46 Aspects). The chart published in Carnival Corporation & plc’s FY2013 Corporate Sustainability Report summarizes the results of the company’s materiality assessment and shows, for each aspect, its relative concern to the company’s stakeholders and its current or potential impact on the company. Materiality is about identifying the issues that matter most to Carnival Corporation & plc’s business and to its stakeholders. “High” and “Medium” issues help the company to set the agenda for its sustainability strategy and for what it included in its current and future sustainability reports. “Low” issues, while important and managed by the company, are not currently covered in detail in the company’s sustainability reporting as they are of lesser concern to its stakeholders. Carnival Corporation & plc plans to perform this materiality and benchmarking evaluation every two years, to make sure it continues to address its stakeholder needs, operational impacts, regulatory landscape and technological developments.